We’d love your help. Let us know what’s wrong with this preview of They Call Me Güero by David Bowles. In Spanish, “Güero” is a nickname for guys with pale skin, Latino or Anglo. But make no mistake: our red-headed, freckled hero is puro mexicano, like Canelo Álvarez, the Mexican box Twelve-year-old Güero is Mexican American, at home with Spanish or English and on both sides of the river. He’s starting 7th grade with a woke English teacher who knows how to make poetry cool. But trusting in his family’s traditions, his trusty accordion and his bookworm squad, he faces seventh grade with book smarts and a big heart. Life is tough for a border kid, but Güero has figured out how to cope. To ask other readers questions about They Call Me Güero, please sign up. I think what I like most about They Call Me Güero is that it’s not a book about a young boy who’s too good or too bad, who’s trying to save the world or even find his place in it. He’s just a boy being a boy doing stupid stuff boys do, hanging with his friends, enjoying school and spending time with his family. Written actually as a collection of poems, the book provides glimpses into Güero’s life as he enters the 7th grade. If you looking for poverty, abuse, gangs and crime then, you’ll need to I think what I like most about They Call Me Güero is that it’s not a book about a young boy who’s too good or too bad, who’s trying to save the world or even find his place in it. He’s just a boy being a boy doing stupid stuff boys do, hanging with his friends, enjoying school and spending time with his family. Written actually as a collection of poems, the book provides glimpses into Güero’s life as he enters the 7th grade. If you looking for poverty, abuse, gangs and crime then, you’ll need to look elsewhere. This is a solid middle class family and he’s kid who likes school, asks a girl to fight for him and loves playing with his friends and cousins. This is clearly an #OwnVoices story, one that serves as a mirror for some and a window for others. Bowles positions TexMex culture, politics, food and language at the center of the story and it’s the joy with which he writes about Güero’s antics that pulls us in, not whether we can relate to the family structure, love of dogs or freckled face. I certainly knew little about life along the Texas border, but this story provided an easy visit. Güero lives in a town near the border between Mexico and the U.S. He’s constantly absorbing the way the border affects him and those around him. Describing himself as a border kid, Güero observes his family life, his friends, and has long accepted the way his identity is shaped by a culture divided by a border. Though the book ( They Call Me Güero: A Border Kid's Poems ) is written in verse, David Bowles manages to pack narrative and emotion to each of the entries, all from Güero’s point of view Güero lives in a town near the border between Mexico and the U.S. He’s constantly absorbing the way the border affects him and those around him. Describing himself as a border kid, Güero observes his family life, his friends, and has long accepted the way his identity is shaped by a culture divided by a border. This first poem reiterates that Güero, though he identifies as a Mexican-American, a border kid, he still struggles with coming to terms with such. Güero’s identity crisis happens a handful of times throughout the book, especially since he is white passing and the kids mock him for it. here and in Mexico, too. Not your fault. Not fair. Just the way it’s been for years. “Don’t let them stop you, chamaco. Push right through them gates. All the ones they kept down. You are us. By the end, we don’t know if Güero actually comes to grips with his identity. However, we get the feeling that since he’s still a seventh-grader, still growing, still maturing, he’ll come face to face with many other obstacles. The ending is still hopeful. Güero still sees the beauty in everything that surrounds him. The book is quite short, the ARC was less than 120 pages, and 100 of those were of poems, the rest with a glossary. I would’ve liked to see Güero develop more, because we did see an emotional arc between him and Joanna, I wanted to get more of his feelings towards his family. We get that he feels proud of and loves his family. In fact, there are times when he feels intimidated by family members. But I just wanted to read more. I don’t know if that’s me being greedy, but I loved Güero. He’s a child of a modern era; a boy growing up at the border and who’s learning about his place in this world of his. He’s soaking up online culture at the same time he’s learning about his own. Maybe we’ll see more of Güero in the future as he continues learning and keeping his heart on his sleeve. 12-year-old Mexican-American narrator that everyone calls Güero, in his home of the borderlands. Bowles wonderfully shows how normal life is living near the border, a far cry from a “crisis area” that some of the country believes it to be. He does this through relatable and entertaining characters in the various blend of poetic forms. The book is humorous and witty with bits of slang, and a diverse mix of characters that offer hints of other cultures. The novel importantly does touch on some complex themes such as; immigration, prejudice, and even the narrator’s nickname, “guero,” a term used to refer to light-skinned men and boys. It's important book for anyone who grew up on the border to read and really anyone to read because it's such a good book and it hit home with me just on the title alone because most people in my family call me guero. And its really cool to see a teen Latinx character that is smart, timid but cool and brave. Reading this, I find myself wishing I could have had a comparable book about a Japanese American kid when I was young. I really do think that it’s a great time for literature, especially children’s and middle-grade lit. I loved reading this book! We cheer with Güero as he overcomes bullies and celebrates family traditions. Bowles weaves this tale of growing up in our beautiful RGV, expertly using different poetry forms. He gives such incredible detail about what it’s like growing up here. If I were a character in this book, I know I’d be traviesos with Güero and Los Bobbys. Well done! This was SUCH a beautiful collection; there was joy, heartbreak, comfort, harsh realities, and laugh-out-loud silliness, but most of all, there was TRUTH. Bowles captures every nuance of life on this border - a place I love and where I've lived and worked and socialized and defended passionately for almost 45 years. While I am not Mexican-American myself (I am of Spanish/Italian/French descent), I have deeply absorbed the cultural texture of this area: i How do I love thee? Let me count the ways! This was SUCH a beautiful collection; there was joy, heartbreak, comfort, harsh realities, and laugh-out-loud silliness, but most of all, there was TRUTH. Bowles captures every nuance of life on this border - a place I love and where I've lived and worked and socialized and defended passionately for almost 45 years. While I am not Mexican-American myself (I am of Spanish/Italian/French descent), I have deeply absorbed the cultural texture of this area: its language, its food, its customs, its daily celebration of life and love - as well as the anger and heartache of the oppression and slings and arrows that have been aimed at these beautiful people that I have come to regard as mi familia! Tamaladas at Christmas, crossing the bridge to go shopping or have lunch "en el otro lado," passing the checkpoint 80 miles north of here (I remember my mother having to show her green card, clutching her passport, too), trips to Monterey - reading about these experiences through Guero's voice transported me to my own growing up years. Such vivid descriptions! What I loved most about the book, however, was how Guero breaks all the stereotypes: he's a nerd, who loves and writes poetry, who shows affection for his dad (and a dad who shows that affection back). This is a collection that ALL middle and high school kids (boys and girls alike, but especially boys like Guero) should read; it will show them that there is no ONE way to "be a man." I am truly IN AWE of this book! Thanks for writing it, David!! Another great book by David Bowles. It had me feeling nostalgic about the days when I was a teen growing up in a border town in the Rio Grande Valley. I could relate to every poem written as if I were the one telling the story. While voices from the border have been historically marginalized, Bowles, and others of his stature, are shining light on a region that has been neglected far too long. This concise book is just what every kid from the border needs to read. I absolutely recommend it. 2019 Reading Challenge this my read it in a day book. I loved that I could see my family and my cousins Ivan and Stacy reflected in it. The tamalada, cascarones and sense of home, family and friendships resonates. Seeing the words huerco and chamaco was a first for me. My favorite poem was Refuge on the Ranch reminds me of home and Uncle Joe’s History Lesson resonates a truth about my family’s lived experiences. Highly recommend!! David Bowles ¡Bravo! The poems seem to reflect the thoughts of a middle school boy pretty well. Sometimes the references to different youth games and apps seems a little forced though and might come across as awkward to an actual tween/teen. But overall, I loved the poems. I thought they were a good mix of giving the everyday perspective of a border kid with others addressing some pretty heavy topics like racism and immigration policy. This book is awesome!! A book you can read, during family time, or you will also enjoy it as an adult. I guess since we had so much in common, this makes it exceptional! I really enjoyed every poem, and got a little laugh of them. I can assume a lot of border kids can relate to this book, and many may enjoy reading it. Also, for the adults that lived through these stages, is a good book to remember the good times!! I really loved reading this book! It is about Guero who overcomes the bullies around him about celebrates family tradition. Through harsh realities and comfort, Guero, a Mexican-American feels he fits in on both sides because he is fluent in Spanish and English. Great collection of poetry that paints a portrait of life on the border (literally and metaphorically). I really loved the richness of the characters and places. I would definitely teach with this one if I were still in the classroom! Recommend for 4th grade & up. Such a beautifully-written book! My daughter and I both loved everything about this book: Güero himself, his relationship with his family, and the larger-than-life setting (and of course, the Spanish sprinkled throughout). Loved seeing the different poetry forms throughout too. Highly recommend! An intense read about a young boy living on the border. His insight into family is both charming and funny. There are rocky points, but he is clear on the love of his parents and extended family. Use the entire book or just selected poems. Relevant to topics of today. I loved that this book not only celebrates Mexican/border culture, but also what it is like to be just a little different from everyone else. there is a handful of books i’d love to gift to my younger self if i could—this one is now on that list. it was funny and lighthearted. i really enjoyed it. Reading this book brought back so many fond memories for me. I'm sure it will do the same for many more. 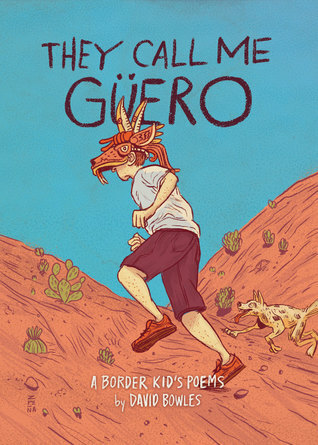 They Call Me Güero: A Border Kid’s Poems is a collection written by David Bowles. The words are both the memories of his own experiences growing up in south Texas and the experiences of past students. The poems come in all different formats. In Spanish, “Guero” is a nickname for guys with pale skin, Latino or Anglo. In the book, Guero is both lighter skinned than his family and has freckles, a trait his family points out will open doors not available to them. He doesn’t necessarily struggle with the fact that he goes between the different worlds of America and Mexico, but he does write poems about his experiences and values both cultures. My favorite poems were about Guero’s father being proud of his construction background and the home he built for his family, making tamales with his family, the neighborhoods of his community, the different sounds of people speaking Spanish, a poem about an owl, and of course: carne asada, which I love. An especially moving poem was about a Honduran boy who was new to the school. Andrés was hesitant in making new friends but eventually warmed to Guero who was his tutor. During math, trying to solve a word problem about a train, Andrés ran out of the room. Guero discovers more about the boy as they talk about why. The back cover of this book indicates that this is a novel in verse. Yet the poems within can be read in nearly any order. The one exception may be found in the poems that speak of the seventh-grade narrator's love interest -- a female peer who is atypically (and admirably) assertive. While the book may be geared toward a young-adult audience, late elementary-school readers might also easily be able to grasp the poetry. The book is fictional, but I'd nearly deem it a memoir, as likely many deniz The back cover of this book indicates that this is a novel in verse. Yet the poems within can be read in nearly any order. The one exception may be found in the poems that speak of the seventh-grade narrator's love interest -- a female peer who is atypically (and admirably) assertive. While the book may be geared toward a young-adult audience, late elementary-school readers might also easily be able to grasp the poetry. The book is fictional, but I'd nearly deem it a memoir, as likely many denizens of southernmost Texas would be able to identify with the content – e.g. raspas (shaved ice, syrup-flavored for a hot-weather treat), tamaladas (when relatives gather and coordinate to make tamales), and scary legends from the borderlands (such as La Mano Pachona). An end-glossary clarifies the Spanish words strewn amidst the mostly English text. I actually thought it was a collection, not a verse novel. It is a marvelous story told by a new, interesting seventh grader with his own issues, bullies and girls, but loving and smart, he knows how to navigate both sides of the border. Twelve-year-old Güero, Mexican American, at home with Spanish or English and both sides of the border. His English teacher shows him how to make poetry cool! I learned from a review that in Spanish, “Güero” is a nickname for guys with pale skin, Latino or Angl I actually thought it was a collection, not a verse novel. It is a marvelous story told by a new, interesting seventh grader with his own issues, bullies and girls, but loving and smart, he knows how to navigate both sides of the border. Twelve-year-old Güero, Mexican American, at home with Spanish or English and both sides of the border. His English teacher shows him how to make poetry cool! I always preface books in verse / poetry with a disclaimer that I don't really like books in verse. I recently read The Poet X and it made me remember that there was a time when I did like poetry. So I was kind of looking forward to reading some more for #hubchallenge19. But nah. I guess I get that he's portraying a middle school boy, but I'm pretty sure when I was in middle school I would have preferred something a little more complex. I did really like the references to legends and folktales. I always preface books in verse / poetry with a disclaimer that I don't really like books in verse. I recently read The Poet X and it made me remember that there was a time when I did like poetry. So I was kind of looking forward to reading some more for #hubchallenge19. But nah. I guess I get that he's portraying a middle school boy, but I'm pretty sure when I was in middle school I would have preferred something a little more complex. I did really like the references to legends and folktales. I saw he's written about that in other books and I think I would find that more interesting. The author reminisces about his childhood as a middle schooler with beautiful poetry. School, nerding out, his family, eating, making new friends... What any particular middle schooler will do. But Bowles captures his rich heritage and the challenges of being born in the U.S. but living close to the Mexican border and going back and forth with his family. Great detail about his feelings and the love of his culture. I love this boy. Love how he loves his world. He feels smarter and more aware than kids I know and can imagine; so I take him as a bit of a fantasy boy -- and this works (it is also how I take John Green's characters), although makes a little distance between me and this world. "Father's Day" made me hurt (in a good way): the sweetness perfectly balanced with pain. And I would read anything about Joanna. Yes to more about what life is like on the border. I want to know. At just over 100 pages this poetry book is a quick read of a boy who lives near the Mexican border. Short poems (typically 1 page) they are fairly self contained. Themes of family, friends, romance (toward the end), growing up, belonging/otherness. Wish more poems were included to create a more fully fleshed idea of the boy’s life. Example, there is a dog on the cover, but the 1 poem about the dog comes deep into the Book. David Bowles is a Mexican-American author from south Texas, where he teaches at the University of Texas Río Grande Valley. He has written several titles, most notably THE SMOKING MIRROR (Pura Belpré Honor Book) and THEY CALL ME GÜERO (Tomás Rivera Mexican American Children's Book Award, Claudia Lewis Award for Excellence in Poetry, Pura Belpré Honor Book, Walter Dean Myers Honor Book). His work ha David Bowles is a Mexican-American author from south Texas, where he teaches at the University of Texas Río Grande Valley. He has written several titles, most notably THE SMOKING MIRROR (Pura Belpré Honor Book) and THEY CALL ME GÜERO (Tomás Rivera Mexican American Children's Book Award, Claudia Lewis Award for Excellence in Poetry, Pura Belpré Honor Book, Walter Dean Myers Honor Book). His work has also been published in multiple anthologies, plus venues such as Asymptote, Strange Horizons, Apex Magazine, Metamorphoses, Rattle, Translation Review, and the Journal of Children's Literature. In 2017, Bowles was inducted into the Texas Institute of Letters.